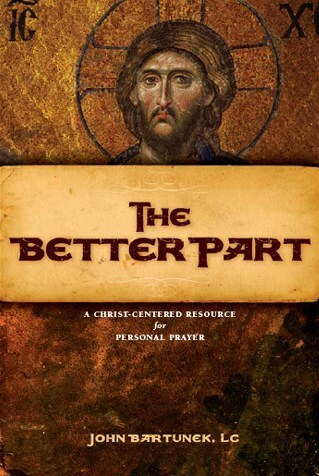 For my birthday Mike got me a prayer book that I’d been wanting called The Better Part: A Christ Centered Resource for Personal Prayer by John Bartunek. I ended up liking it so much I thought I’d do a post on what it’s all about. It’s written by a Catholic priest, but any Christian could use it as a daily meditation tool. Format – The first section is a detailed guide to Christian mediation. Basically a how-to. And it breaks Christain meditation into 4 categories: concentrate, consider, converse, and commit. The second (and main) section is divided up into small units including a passage from the Gospels and a four-part commentary based on the same four themes throughout the book: Christ the Lord, Christ the Teacher, Christ the Friend, and Christ in My Life. It’s easy to commit to reading and meditating on one of these units a day. Additional Guidance – After each small unit there are also questions if you were to use it in a group setting. There are also suggested Catechism readings after each unit for further examination. Two indexes are included. One list the units in the order in which the Gospel passages appear throughout the liturgical year. The second lists them in relation to virtues of the spiritual life. This book has a lot to offer. The first section of the book I found to be very beneficial. It’s a great reminder of things to remember while praying to ensure that you’re getting the most out of your prayer time. Think of it as a miniature ‘how to pray better’ boot camp. Having that part to refer back to while reading through the small units will be handy. Thanks for the suggestion! It looks great.